At SOMM Wine Distribution we chose our producers with the utmost care. All the wines we work with have been selected by our team of highly experienced sommeliers. Wines with a great level of definition, style and immediate deliciousness. More often than not, from high altitude vineyards throughout the great wine regions of Europe. Contact us for our price list. We deliver throughout Ibiza and Formentera during the whole year. This is traditional Grower Rioja at its best! Bodegas Akutain strives to produce wines in the traditional style set forth by the Grandes Bodegas, but on a much smaller scale, and most importantly to singularly reflect the wind-swept, high elevation terruño of Rioja Alta. Akutain has begun converting their highest elevation vineyard, Gembres, to organic viticulture, with the rest of the estate following suit. Altavins was created in 2001 by Joan Bautista Arrufí and Jordi Casadó. From the very beginning, this winery has worked towards putting the traditional Terra Alta grape varieties in their true hall of fame. This is a small winery with production limited to 120,000 bottles per vintage therefore, utmost care have been given to growing the grapes and transforming them into superb quality wines. Adegas Gran Vinum is a family winery owned by Enrique Pineiro. In 1998 the Val do Salnes subregion was added to D.O. 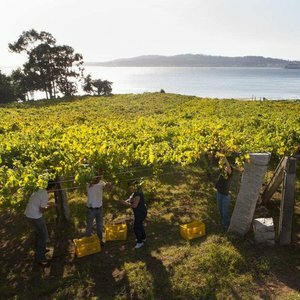 Rias Baixas spurring a renewed focus on quality wines. Adegas Gran Vinum reacted by adding new vineyard plots on steep, sandy, south-facing slopes, near the ocean which minimized temperature swings and extended maturation times giving more spice, saline and fruity varietal character to the wines. José Luis Aristegui made his first wine in 2011, and have in less than 10 years managed to become one of the reference producers for natural wine in Galicia. From his modest winery in the village of A Rúa de Valdeorras he produce a few thousand bottles annualy, with minimal intervention techniques. His grandfather planted the vineyards in the 1930s, the grapes include Mencia, Godello and Garnacha Tintorera. The Atlantic influence and personality of José Luis marks the style of these highly quaffable wines. When Tomas Cusine, Xavier Cepero and Eric Solomon started working on a project there was no doubt that a mountain would be involved. A short list of the benefits of altitude would include: interesting geology, drainage, poor soils, diurnal temperature shifts and higher UV exposure. 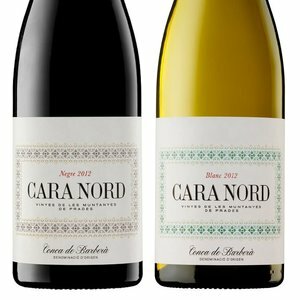 Cara Nord are wines from Sierra de Prades in the DO of Conca de Barberà located between the Priorat and Costers del Segre. Like many DOs in Spain it has an ancient history of winemaking dating back to at least the middle ages if not far earlier. Tomeu Llabres of Ca´n Verdura opened the doors to his winery in 2012, still today it’s located in a garage outside the town of Binissalem. His wines are all energy and youth, unlike any others on the island. They are all produced with minimal intervention methods, and in minuscule quantities. Tomeu is representing the most rebellious, modern and extravagant side Mallorca. Of course we had to work with Tomeu Llabres! The wines of Costers del Priorat are all about elegance and balance, far away from the strong and over-extracted wines of the past. Winemaker Jose Mas Barberà has a diffrent approach, spontaneous fermentations with the yeast from the vineyad and the use a multitude of vessels that allow air exchange. These are some of the techniques he uses to achieve power through elegance. The blended cuvées, Petit Pissarres and Pissarres are perfect introducion to his style, in the single vineyard wines Clos Cypres and Clos Alzina he takes it one step further. 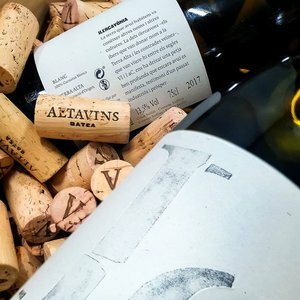 In 2005, the Cusiné family, following a long tradition of passion and dedication of elaborating wines in the Penedès as Parés Baltà and in the Priorat known as Gratavinum decided to initiate a new project in the Ribera del Duero, applying the guidelines set by the first winegrowers of the region. In order to achieve this we selected vines that reflect best their philosophy: old Tinto Fino vines spread in different zones of the denomination, trained in bushes. We also distrubute the Gratavinum wines. Getariako Txakolina is the largest of the three sub-regions, located close to the coastal town of San Sebastián. HIKA is one of the newest wineries in town, build on passion and enthusiasm for creating an exclusive, modern and elegant txakolí. The vineyard is managed in an environmentally friendly way without herbicides and all labour is manual. Their first and only wine is impossible to ignore, full of vibrancy, a fresh citrus nose and with a juicy palate with round succulent stone fruit flavours. Winemaker Tom Puyaubert arrived in Spain at the beginning of 2000, leaving his native Bordeaux in order to settle in La Rioja and increase sales for a French cooperage. In 2003, he decided to set up Bodegas Exopto. Toms winery demonstrates to perfection a complex balance between modernity and tradition. All the Tempranillo vineyards are located in the town of Abalos, in the Rioja Alta, where the climate enjoys an Atlantic influence. The Garnacha and Graciano vineyards are mostly situated on the hillsides of Monte Yerga in the south of La Rioja. Martínsancho is the late Angel Rodríguez' 17th-century vineyard, a local legend responsible for the preservation of Rueda's indigenous Verdejo grape. The vineyard is now run by his children. Cuttings from here were used in 1976 to establish a 25-acre vineyard planted in the traditional head-pruned fashion and dry-farmed. Low-yield Verdejo apports viscosity and a long finish while retaining a delicate floral nose. The family does only one wine. Ramón Jané broke 500 years of family tradition in 2006 by vinifying a portion of his grapes with his wife Mercé Cuscó and best friend/oenologist Toni Carbó as Mas Candí—they had always sold their crop to large cava producers. They remain grape growers first, farming biodynamically on the inland edge of the Garraf massif, and plan to keep their production limited. Over centuries of tasting, the Jané family has tailored their farming to focus on indigenous Xarel.lo, which grows best in their living calcareous clay soils. Bodegas Navarro López was founded in 1904 as a modest family winery by Don Juan Sánchez Megía. The original winery still stands today in the town of Valdepeñas. At SOMM we are working with a special range of wines called Don Aurelio from the families own vineyards in Valdepeñas . We consider these wines to be some of the most competitively priced in Spain. We are fans of the wines of Enriqueta and Diego since the first vintage in 2010. Epitafio and Triens has from day one been one of the purest expressions of the Tinta de Toro grape. Epitafo comes from two of the highest vineyards in Toro (San Román de Hornija) the over 100 year old "Monte Viejo" and "La Victoria". Founded in 2006, Sedella is the personal viticulture and enological project of Lauren Rosillo, a innovative winemaker that is extremly respected among his peers. The small vineyard is located in Sedella a small town of 400 people, has 2.5 hectares of vineyards rooted in historical steep slopes of slate. The cultivation of the hundred-year-old vines is executed in an artisan manner, using draft animals, Roman plows and ancient techniques. High up in the foothills of the Sierra de Toloño, in Rioja Alavesa, Sandra Bravo works in some of the oldest, and highest altitude vineyards in Rioja, growing Garnacha, Tempranillo, Viura and some Graciano. This young winemaker who worked in France, New Zealand, and Italy before coming back to her native land translates the mountainous landscape into pure and expressive wines. Sandra Bravo is awarded `Wine Maker of the Year 2019´ by Tim Atkin. The two Cueva Llana-wines from Señorío del Júcar are both grown in a privilaged spot by the river Júcar in eastern Spain. The river makes its way through the massive limestone formations forming a canyon with cliffs over 200 metres high. The vines that produce Cueva Llana Shiraz are located at an altitude of 850m, which is beneficial to the ripening process since this keeps the grapes fresher. For the white Macabeu this privilaged terroir results in a complex wine with aromas of mango and pineapple. Both wines come with an Organic certification. This is a new project that shows great promise, fresh wines from Garnacha grown in the trendy Gredos mountain region. Loved by sommeliers on Ibiza since the first day we started selling them. At Soto I Manrique they work as natural as possible avoiding any kind of external elements that can vary the personality of the varieties. It's a full corporate social responsability project. The respect for the natural enviroment where they work, solidarity with the workers, the love for the vineyards and the promotion of the wines through the world compose the dna of the company. Veronica Ortega might be young, but her experice in winemaking surpasses many of her older colleagues. She has worked with Alvaro Palacios, Daphne Glorian, Raul Perez, Comte Armand and DRC. She farms small plots in Bierzo planted with up to 80 year-old Mencia vines. The limestone soil has a high proportion of sand which give her wines aromatic complexity and lively mineral acidity. Most fermentations include 30-50% whole clusters. Her wines are as natural as they get, nothing added, nothing taken away. This Morell family estate is comprised of nine parcels on the outskirts of Tarragona on Spain’s Mediterranean coast. The vineyards lie within a mile and a half of the sea, and their soils are composed of calcareous loam derived from fossil limestone, which is referred to locally as lumaquela. Viticulture is sustainable and yields are held to a scant 1.5 tons per acre. Careful berry selection is followed by natural fermentation and aging during one year in seasoned barriques seeking minimal wood influence. Romaric Chavy took over the domaine from his father Hubert at just 22 years of age. He started at the wine school in Beaune at the age of 12, before working as an apprentice for his godfather François Mikulski. Incredibly experienced for such a young winemaker, Romaric is totally focused on realising the unbelievable potential of his stellar vineyard portfolio. About 40% of Romaric’s vines are in Puligny-Montrachet, where he has parcels in spectacular sites such as Les Enseignères, Premier Cru Les Folatières and Premier Cru Champ Gains. These are some of the finest Provence-style rosés. The winegrowing estate is classified AOP Côtes de Provence and is more than a century old. The estate used to bring the grape harvest to the local cooperative, but when Gilles and Pascale Pons took over in 1997, they decided to make their own wine. They built a modern winery and called the domaine "Les Valentines" after their children, Valentin and Clémentine. Château Les Valentines now covers approximately 100 acres. When Domaines Rollan de By designs their wines, they want to give the best interpretation of the essence of the Medoc, obtaining the perfect combination of 4 components : the soils, the grape varieties, the environment and the expertise of the teams. Thanks to this constant work, the estate has successfully made its way to become one of the over-acheiving estate in the Medoc. The ”Les 7 Lieux” range of wines are showcasing seven diffrent Biodynamic vineyards in Chablis. They are produced at the Domaine Jean-Marc Brocard winery as a creative endeavour by Julien Brocard. All the wines are fermented in foudre and produced with minimal intervention practices. They have released a small amount of stellar wines since 2013, we have selected the very best of these to our portfolio at SOMM. With selective harvesting, Mayer guarantees elegant varietal characteristics and an animating structure of the wines. Due to the great variety of single sites, soils with strongly varying chalk content and old vines (average age of productive grapes – 30 years) Mayer am Pfarrplatz specializes, besides Gemischter Satz, on Riesling and Grüner Veltliner. The Gemischter Satz (already the fourth generation) is harvested on the basis of Grüner Veltliner, Riesling, Zierfandler, Pinot Blanc, Rotgipfler from 3 parcels on Nussberg. Castellare di Castellina has vineyards covering 33 hectares on the hillsides of a natural south-east facing amphitheatre, at an average height of 370 meters above sea level. The vines are aged between 7 and over 45 years, and yields per hectare are kept very low to obtain the maximum quality. Excellent exposure to the sun, good water drainage and a mixed soil containing limestone marl, galestro and little clay produce well-structured, intense wines, both red and white, suitable for long ageing in the bottle. Everything started back in the summer of 1993, when they purchased an old farmhouse surrounded by three hectares of vineyards and two hectares of olive groves. 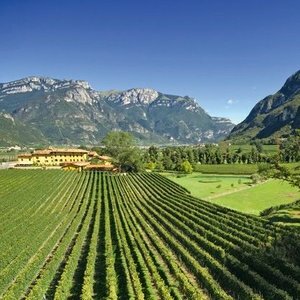 In the year 2000 – after completing the renovation of the farmhouse and its underground cellar – did they turn to the prestigious Oenology Institute of San Michele all’Adige, in Trento, to find a young enologist to join the team. Diego Bertoni took up the challenge and is still the enologist. If Tuscany and Piedmont are the regions that produce Italy’s most excellent wines Sicily, on the other hand, one of the country’s most historic wine regions, has in recent years been increasingly asserting itself as a land of great wines. The estate dates back to the 1700s and was one of the largest in Sicily. The Rocca di Frassinello project was inspired by a very simple idea – or should we say a very simple need: to replicate the model of excellence set in motion by the Castellare di Castellina winery in a new region. They set their sights on the central Maremma area, between Bolgheri and Scansano, where a sort of geological foot can be found, with the same characteristics as the Chianti and Montalcino terrain. San Leonardo is the magical heir to a tradition known the world over as Bordeaux blending. Dreams and heritage mingle to bring you a wine that conveys all its land-rooted character and genuine territory-focused appeal. A powerful yet elegant red, San Leonardo brings together the colours, aromas and savours of Cabernet Sauvignon, Carmenère and Merlot aged in small oak barrels, melding them harmoniously into a uniquely intense, full-bodied wine with superb depth of flavour. Are you a restaurant owner on Ibiza?